This quote means that Success comes to those who prepare well and put in the effort. We at ASM Group of Institutes follow the same. But before we start let’s go through some key facets of ASM Group of Institutes. The institute was established in the year 1983 and has 35 years’ excellent history in providing quality education. It is a complete educational offerings right from the KG to Ph.D. The campus has a state-of-the-art infrastructure which creates a pleasant atmosphere for students to learn. The institute has a strong alumni connection with 66K+alumni placed in reputed companies all around the globe. Job fairs are conducted at the campus every year providing students with the platform to connect with the recruiters. Every event receives an applauding response in terms of applicants, companies participating and job offerings. 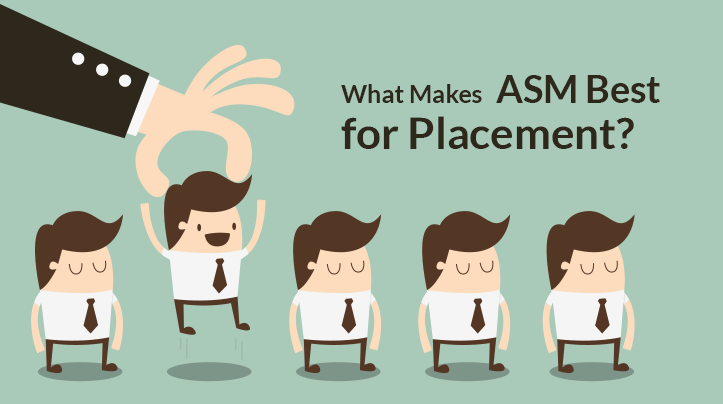 Now the question arises what are some of the qualities which help ASM institute screate a great placement records? Any guesses? Let’s check out below. Let’s go through them individually. Placement cell is one of the important departments which are responsible for placing students. This is so because placement officers are the one responsible for coordinating with different industries and companies. So, if your placement cell is efficient enough then it can make the process a successful one. The better alumni network, the happier students and placement records an institution gets. The course curriculum should be updated regularly in order to match the requirements of the modern industries and ever-changing professional world. This is one of the essential aspects which can affect placement records of any institute. It has been observed many a time that college start the training process in the final year but if it is started from the first year,it benefits both students and the institute.Also, the college should provide such a training and certification which is focused on the current demands of the industries. Students should get the opportunity to learn under the supervision of faculties who are from across the globe. This can add up value to the learning process of every student. These were some of the points which can help ASM Institutes to come up with great placement records. The colleges and institutes of ASM can be considered as the all-in-one solution for you to get a cutting edge for successful future endeavours. For more details about the variety of programs/courses offered at our institutes, colleges and schools visit:www.asmgroup.edu.in. You can also reach us at, Phone: No: 020-27475090 / 27478666, Mob: 9422009207 /09/10/12, or Email at: enquiry@asmedu.org / admission@asmedu.org.